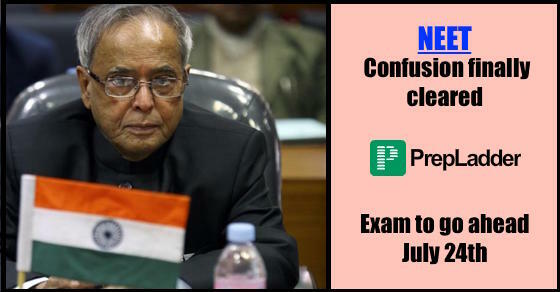 The uncertainties surrounding the conduct of a common medical entrance exam have been laid to rest with President Pranab Mukherjee signing the controversial ordinance which exempts the State Governments from the requirements of conducting NEET for admission to under-graduate courses for the session 2016-2017. President gave his nod to the ordinance after seeking detailed clarification from the Health Ministry on the scope of the executive order and on sound legal opinion. The Centre has laid the ordinance through amendments to Indian Medical Council Act, 1956. The ordinance came days after the Supreme Court mandate which directed the conduct of NEET as the sole basis for admission to Medical and Dental seats for all Government and Private institutions this year. Several State Governments opposed NEET arguing that this would exempt them from the authority of regulating admissions to State Medical Colleges and private institutions under their jurisdiction. The Centre faced opposition from many States and had to bring this ordinance after facing pressure from States. NEET is a National Level Entrance exam conducted for admission to UG and PG Courses in Government and Private medical institutes. Currently, there are at least 450 medical colleges spread over the country offering more than 52,000 seats with admission through nearly 80 different entrance exams. There was a demand for a common platform for admission to both UG and PG courses to ensure economic use of resources. A major breakthrough occurred in 2010 when the Centre introduced NEET but the Supreme Court passed a judgement in 2013 framing the test as ‘unconstitutional’. However, in April 2016 Supreme Court gave its nod to NEET as a sole entry point for admission to UG and PG courses throughout the country. Seven States including Bihar, Haryana, Himachal Pradesh, Madhya Pradesh, Rajasthan, Manipur, Odisha and union territory Chandigarh have agreed to conduct NEET for the session 2016-2017. States including Karnataka, Gujarat, Maharashtra, Kerala and Tripura have got an exemption from NEET this year. States including Andhra Pradesh, Telangana, Uttar Pradesh, Chhattisgarh, Assam, Punjab and West Bengal have the option of conducting their own exam or NEET for the session 2016-2017. States like Tamil Nadu and Puducherry follow their own procedure for admitting students. Union Health and Family Welfare Minister J P Nadda stated that the aim of the ordinance is to provide a firm Statutory Status to NEET making it as a sole basis for admission to UG and PG courses in medical/dental colleges. However, the state governments have been given a choice for conducting UG admissions for the session 2016-2017 in view of their difficulties. NEET serves as a common uniform platform for admission to all UG and PG medical and Dental courses across the country. It serves as a standard procedure for admission to all UG and PG courses thereby eliminating the chances of biased admission. Why are State Governments opposing NEET? State Governments feel that the introduction of NEET would exempt them from the right of regulating admissions in institutes under their jurisdiction. The Introduction of a common entrance exam is absolutely faultless as it would address the problem of institutions selling medical seats at astronomical prices to undeserving candidates. However, the ground has to be prepared prior to the implementation of the common entrance exam. Leave your comments in the section below !